This Week In My Classes: So Much To Do! Also, a New OLM! It’s the time of term when I really just have to focus on doing one thing at a time: if I contemplate the big picture, it’s overwhelming. The truth is, everything does not in fact need to get done in a hurry or come due at once, but the constant appearance of more items on the ‘to do’ list creates that impression–and thus generates panic–if I’m not careful. Requests for reference letters are streaming in, for instance, and just fielding the inquiries and receiving and collating the documents and forms is a lot of virtual paper-pushing, but the deadlines are in fact spread out between now and January or later, so I have to be careful not to put these nice finite tasks ahead of more amorphous ones that are actually more urgent, if less defined. I do have one extraordinary event coming up next week, a Ph.D. defense (I’m the supervisor): it is not optimum to do these in the middle of term, but that’s how it’s happened, so by next Friday I need to review a 450-page thesis. Given just how important an event this is for the student and our graduate program, more routine business may have to get set aside–marking, for example. Nobody will suffer anything worse than a little suspense if the papers and responses currently awaiting my evaluation take a bit longer than usual to come back. Routine business goes on, though, in all three of my courses. In Introduction to Literature, we’ve started our short fiction unit, which wraps up the basic ‘introduction to genres’ I’ve been focusing on this term. Next term we revisit all the genres but, as I said to my class today, from a position of strength! We won’t be beginners any more, so we will read longer texts as well as texts in thematic clusters that provoke different kinds of conversations than the ones we’ve been having. My expectations will go up, and they will have a larger role in presenting and analyzing the readings, including, I think, more collaborative group work. I’m really pleased with the good will and hard work I’m seeing from the students in this class so far. I know that they are feeling a lot of pressure at this point in the term too, but they’re hanging in there, and, I hope, feeling that at least in my class they are clear about what the expectations are and supported in meeting them. In Mystery and Detective Fiction, we’re reading The Terrorists. It really is a superbly interesting and provocative book. Today’s focus was on the plural form of the title, and how the presentation of the different acts of violence and coercion in the novel challenge us to think about innocence and guilt, about motives and justifications, about not “whodunit” but about why. The two convicted murderers in the novel are both people for whom we feel a great deal of sympathy, while their victims hardly seem to deserve the protection of the state. Next class, when everyone has finished the whole book, we’re going to discuss our standard questions about the conclusion — is justice served? on whose terms? what does the novel present to us as a ‘just’ outcome, and how closely does that track what the law declares to be right or wrong? — and then I’m going to open up the discussion further to look back across our earlier readings and start trying to do some more comparative and synthesizing analysis, because whether they write the final exam or do the optional paper, they are going to have to reach a bit more than we’ve been doing on our assignments so far. In The Somerville Novelists we are moving into the controlled chaos zone of planning the collaborative wiki project. It is a delicate balancing act for me. I need to avoid dictating exactly what I think will work and how I think they should do it (something I know some of them would prefer) but at the same time provide enough guidance and insight that they can make the best use of their time and resources. They’ve been doing some planning on their own, but we met as a class today and I think that it was just in time in some ways, because I realized that there was a risk of their thinking being a bit too narrow, a bit too zoomed in on the particular texts they’re working on, so that the larger framing issues the course aims to address were not part of the conversations they were having and thus not part of the plans they were making–issues like canonicity, for instance, or relationships between gender and genre. I had a chance to make this point today, I hope in a constructive way, and we will return to the discussion and to the planning process on Wednesday. I need to step back soon and let them build their wiki sections, but it’s really important that they not rush to formalizing the structure of their projects before we’ve worked out the conceptual issues better. In order to maintain the momentum of today’s conversation, I’m postponing Wednesday’s planned session on “Pecha Kucha,” which is actually a bit of a relief: I have been working industriously on my sample presentation and would have been ready for Wednesday, but I’ll be better rehearsed on Friday. 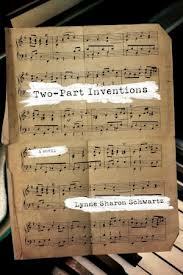 In other news, in case you missed the Twitter and Facebook announcements, there’s a beautiful new issue of Open Letters Monthly up, including what will almost certainly be my final OLM contribution for 2012: my review of Lynne Sharon Schwartz’s new novel Two-Part Inventions. I was so sorry not to be more enthusiastic about it, as her novel Disturbances in the Field is one of my all-time favorites. I wrote about it briefly here, and I wrote at length here also about my great admiration for Leaving Brooklyn. During the editing process, one of my co-editors asked if my review was an implicit response to the recent brou-ha-ha about critics being “too nice.” It certainly was not–at any rate, I did not set out to be not nice, and I hope the review does not come across as anything but what I believe it to be, which is honest and thoughtful. In his “Critic’s Manifesto,” Daniel Mendelsohn proposed that “The intelligent negative review … does its own kind of honor to artists: serious artists, in my experience, want only to be reviewed intelligently, rather than showered with vacuous raves—not least, because serious artists learn from serious reviews.” I agree that taking a work seriously is a way of honoring it and its author, and in this case (as with my review of Jeffrey Eugenides’s The Marriage Plot) I tried to write an “intelligent negative review.” It’s not the kind of reviewing that gets a lot of attention: it’s no good at all as link-bait, compared to the outrageous pan or the “vacuous rave”–but it’s hard work and I think does more service to readers and writers than either of the more extreme alternatives.